AFTER nurturing his design firm in an incubation unit, a Derby entrepreneur is spreading his business wings at Friar Gate Studios. Chris Redshaw has moved graphic and web design business Revolver Revolver to Derby’s creative industries centre from Derby University’s Banks Mill. 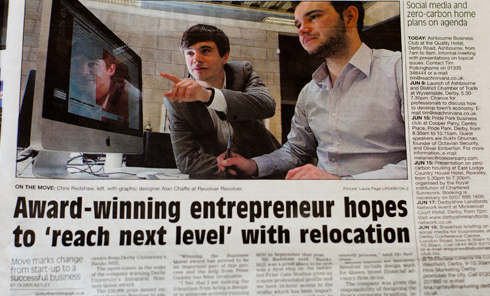 The move comes in the wake of the company winning Derby University’s inaugural Business Quest award. The £20,000 prize money enabled Revolver Revolver to employ an additional designer and mentoring from Derby entrepreneur Peter Gadsby is helping the business reach the next level. Mr Redshaw said: “These past few months have seen us transform from a start-up to a fully-fledged business. “Winning the Business Quest award has proved to be an important part of this process and the help from Peter Gadsby has been invaluable. “I feel that I am making the transition from being a designer to someone actively running a business,” said Mr Redshaw. After working for a design agency in Nottingham for four years, Mr Redshaw took a degree in new media at Derby University before founding his company in 2008. Initially working from home, the business moved into Banks Mill in September that year. Mr Redshaw said: “Banks Mill was a great place to be and was a first step on the ladder but Friar Gate Studios gives us a more professional profile and we have 24-hour access to the studio which has been important when we’re working to tight deadlines. “Relocating was really easy as well because the phone system here was set up and it was a question of plug in and play. “It only took a couple of hours to move, we kept our phone number and it was a smooth process,” said Mr Redshaw. Recent success for Revolver Revolver include design work for Queen Street financial advisory firm Avisa. The company was given the responsibility of designing the firm’s corporate branding, including graphics, logos and the website. Revolver Revolver has also been involved in branding Derby firm Instant Telemarketing, including its website, logo and livery for the company’s Smart car. Design agency re-brands successful educators. In-house team or external design agency?